Let’s keep you off the ground. Having the best RV jack gives you the highest level of safety for you and your family, and the peace of mind that nothing will go awry while you’re using it. From weight distribution to electrical voltage, installation and more, we’ve covered everything you need to know in this guide. Let’s go over our top five picks for the best RV trailer jacks on the market, then dig a little deeper into what makes them tick. What Situations Requires An RV Jack? Can You Use A Car Jack To Lift Your RV? 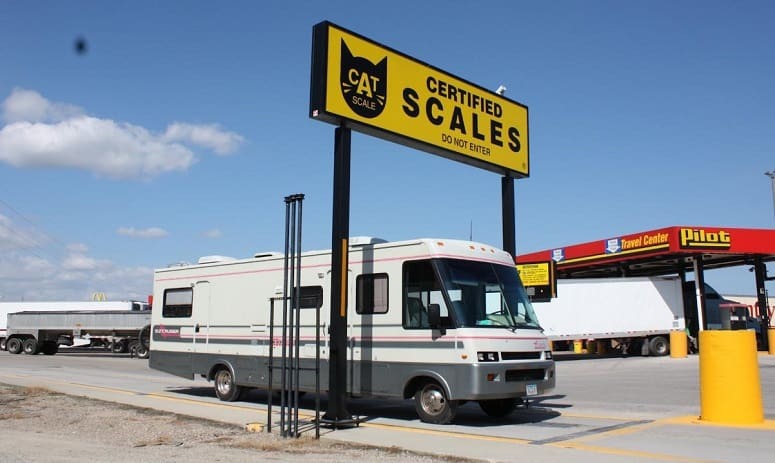 How Much Does An Average RV Weigh? Do Electric RV Jacks Use 12V Power? Should I Get A Jack Pad? Where Will Your Road Take You? We’re no stranger to Lippert products and their fantastic customer service. They’ve hit the top spot on this list for their insanely simple installation process. Hooking up this 30 amp, 12V unit is one of the fastest additions you’ll make to your RV this year. 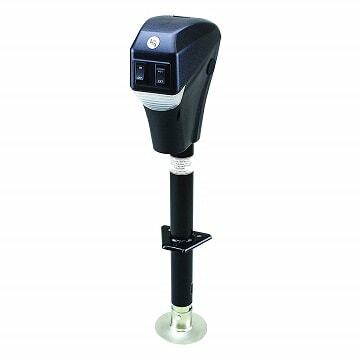 Lippert includes the mounting hardware that you’ll need with this purchase, as well as one of our favorite features on any camping RV jack: LED lighting. You get four lights to illuminate what you’re doing, resting on the back of your unit. This is absolutely fantastic when you arrive at an RV park or area way later than expected (we’ve all been there), and you don’t want to run through the hassle of a long-winded setup. While it’s a simple process, it is lengthy. 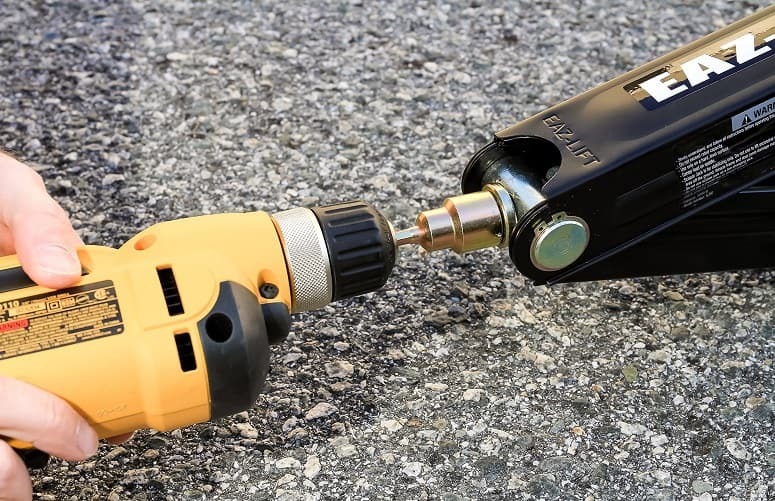 This electric RV jack takes a few minutes to work, and while it’s not noisy, it does have you rocking back and forth on your heels wondering when it’s going to be done. Apart from that, the only other gripe is the price. Lippert’s systems are designed to last for five or more years, and although they’ve had some trouble in the past with previous models in this series, they’ve been quick to correct them. There’s an excellent extension range of 18”, as well as a sturdy construction that stays properly in place. Husky brought a lot of power to the table with this one. First and foremost, this works well for up to 4,500 lbs, and makes your standard operation a lot easier. You get a three-sided LED lighting system in the back. While is could use a bit more concentrated light on the rear, it’s bright enough that you won’t be fiddling with the flashlight mode on your phone anymore. It does fall short on one major accord, though: there’s no backup crank. While you won’t find a lot of models including the backup crank, they at least have an open area to use your own as an option. Husky’s model rides and dies by its 12V DC power source. While we were happy with the weather-resistant coating on this unit, we were a bit perplexed at why it also wasn’t applied to the 6” drop-down. If you’re looking for a great range, you get a total of 24” of extension space. Husky throws in a one-year limited warranty with your purchase, and makes this unit very simple to install. If we were going off of installation process alone, it would be a neck-and-neck tie between Husky and Lippert. Quick raise (47 seconds per 6” raised) and a sturdy construction; a solid, quality choice for your RV. The BBX gives you a fair deal of power for a low cost compared to other jacks we’ve looked at so far. As one of the least expensive electric options on our list, you’ll be able to fortify your short fifth wheel trailer without running into the hassle of a hand crank. This holds up to 3,500 lbs, operating on 12V DC power, and gets the job done without finishing off your wallet. Like you’ll see with most of these RV jacks, you get a one-year limited warranty, giving you ample time to put this through its paces. One of the best things you could ever ask for in an RV trailer jack is sufficient LED lighting. While these lights aren’t as powerful as the other models we’ve talked about so far on this list, it still provides an excellent low circle of light around your unit (three-sided setup) to aid you throughout nighttime operation. If you’re getting to the RV site late, this is a Godsend. Most of this unit fires on all cylinders, but the drop leg and its lack of refinement is a bit troublesome. It’s not weatherproof coated and built very roughly, so you’ll experience a lot of scraping and warping as time goes on. Installation takes a little while, but once it’s put into place you’ll be glad you put the time and effort in. Manual jacks have their place, and if you’re not keen on relying on 12V energy to handle your RV, you’ll be head over heels for the Eaz-Lift. Not only do these comes with a fantastic 7,500 lb capacity, but you also get an anti-rust treatment on all the steel, so you’ll keep this in out-of-the-box condition with little to no upkeep. You will run into problems, though: there’s no thrust bearing, which directly affects how you level your RV. These are used primarily for stabilization, so you’ll really need to pay attention to what area you’re dropping anchor in. That being said, the soft roll pins are of good quality, but they really get worn out, and may need to be replaced after six months of use. It’s all tied back together when you look at the insanely low cost. Two jacks to a pack, plenty of saved money, and a decent warranty from the manufacturer to help you sleep a little easier at night. We tested eight different top-rated manual jacks, and these blew the rest of the competition out of the water. Last but not least, Bulldog’s simple manual jack system comes with plenty of benefits for a true camper. 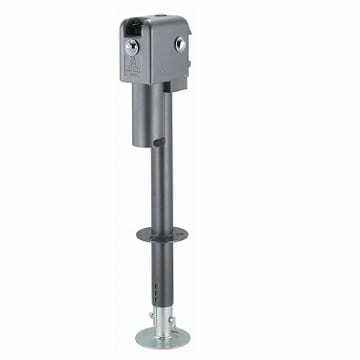 This manual jack is designed with reinforced steel, and boasts an impressive extension range of 15” from top to bottom. 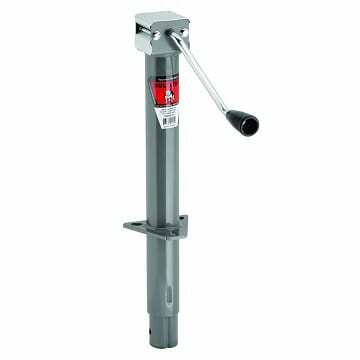 The beauty of manual jacks is the cost, but Bulldog wanted to give you a bit more bang for your buck: this jack can hoist up to 5,000 lbs. Since it is manual, you’re going to encounter some resistance that requires great force when you’re pushing it to the limits. Apart from that, the only major grievance with Bulldog, and the reason they didn’t beat Eaz-Lift in this race, is that the system doesn’t come well-greased. In fact, you’ll need to grease the joints once every three months just to maintain full function. Failing to do so could result in damages. That’s where their impressive five-year limited warranty comes into play. They boast an easy installation process, as well as fantastic customer support, which is what helped tow them over the line and prove to be a valuable brand in this space. 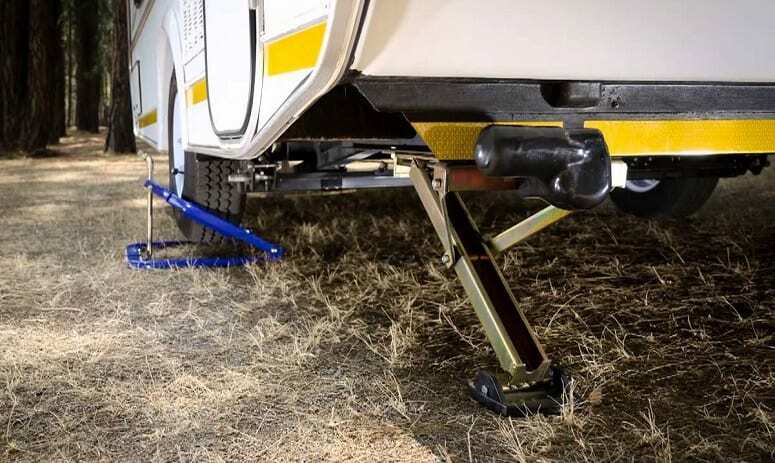 Even though Bulldog didn’t rank near the top of our recommendations, it didn’t make it on this list by chance: this is a quality, cost-effective RV jack that’s reliable above all else. 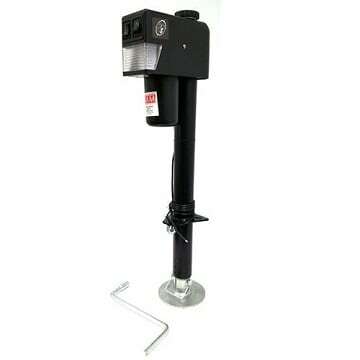 The very best time to buy your RV jack is when you first purchase your RV. If you can, bundling it into the initial cost can save you some cash. Fortunately for you, if that wasn’t an option or you bought your RV pre-owned, we’ve located the best RV stabilizers for you on the market. We’ll help you whittle down your budget and options, from electric to manual, and explain the main things you need to be on the lookout for to get the most out of your new purchase. If you’re a fifth wheel owner, then you can’t afford not to have a quality jack. If you want to plan on using your truck to explore the local scene without having to tow the entire thing with you, you’re going to need something reliable. But it isn’t just that obvious; we wanted to lay out some of the situations where you’d need your jack, and what it comes in handy for. Even if your RV has a built-in system to maintain your level, it might not offer the same stabilization that the jacks on this list do. You never know where you’re going to park your RV, but you can make one safe assumption: whether it’s on asphalt, concrete or the good ole earth, it’s likely not going to be perfectly level. Stabilizers and leveling aid go a long way with the right jack. We talked about putting your fifth wheel on asphalt or concrete. This is common when you drop anchor at a convention, you’re tailgating before a big game, or there are designated patches of asphalt at certain RV parks for you to park on. Your jack can actually cause major harm to the asphalt, leaving depressions, cracks or crevices, and possibly causing you to pay a fee. Sometimes it can take a few days of constant use for this to happen. The best thing you can do is get a jack with a pad, also known as jack foot protection. 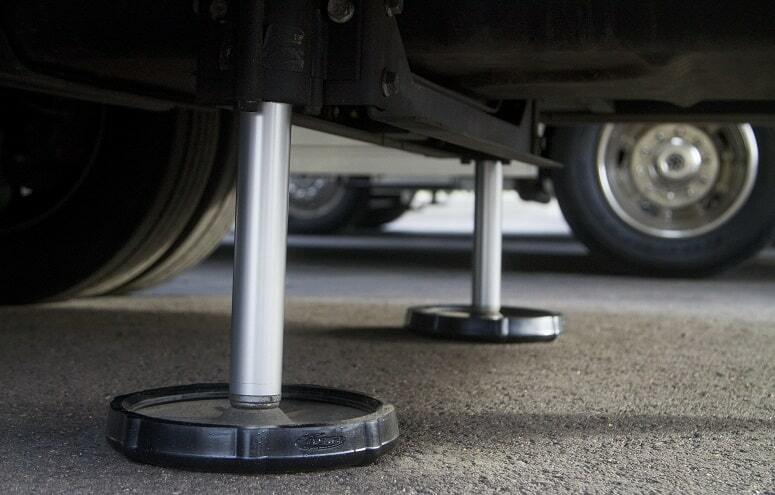 These not only help you relieve pressure from the asphalt, but also keep the end of your jack safe. No scraping, no rusting or other common issues, so you get to use it confidently without running into problems. Nothing is going to throw off your balance and center of gravity like walking up and down an unlevel RV. When you park it in place, not having it level can cause problems inside with your toilet flushing properly, your fridge functioning as it should, and you’ll find that you bump into things a lot more often. You need a good jack so you can enjoy every aspect of your RV. Some RVs require you to use certain types of jacks (primarily due to weight restrictions), while others have bit more flexibility. We’re going to break down the most popular types of jacks used by most manufacturers, so you can get a feel for your options. These are mounted directly to the sides of the trailer. This requires a bit of know-how to ensure you’re not drilling into a spot that you shouldn’t be, and takes about thirty minutes to install. These can either be electrical or manually operated, and typically boast impressive maximum weight capacities upwards of 12,000 lbs. In some cases, landing gear can even support more. Emulating a photographer’s camera tripod, this is used to stabilize your RV in a widespread fashion, allowing for immense weight and pressure to rest on it. Typically, you’re going to see these hold up to about 6,000 lbs, rarely more than that, and you’ll have inexpensive options to choose from. They usually contain jack pads to prevent digging into the ground, and work to keep everything level. These get a bit invasive, because you have to weld these onto the frame of your trailer. You’ll need a bit of DIY mastery to accomplish this, but it does have its benefits. For one, this supports roughly up to 8,000 lbs, and is fairly simple to operate once it’s installed. You’ll find side and top crank varieties, and a median cost range. These come with four to a set, and activate based on pressure. Equipping the four corners of your RV with these allow you to adopt a “set and forget” mentality. There’s very little work to do when you actually place your RV somewhere, because these all act on the current weight of the trailer and adjust appropriately to keep everything properly level. You can expect a hefty 20,000 lbs of hold, since each jack will roughly take a quarter of that weight. 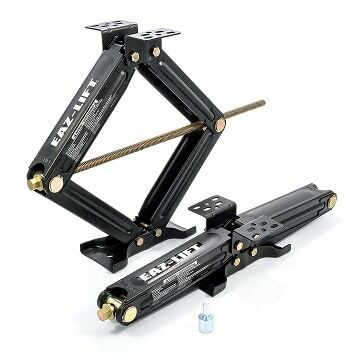 These bolt underneath the frame, and give you about 5,000 to 7,000 lbs of weight capacity. The reason electric stabilizers are so popular is the rapid adjustment period. If you’re full-timing with your fifth wheel across the country, you’ve probably counted how many minutes you’ve wasted setting up shop in different areas. These save you time, after a bit of an involved installation process. So what’s the better option? There are pros and cons to going with electric, and the same goes for manual. Part of this will come down to preference, but the size of your RV will also dictate your options. Manual leveling jacks are known to withstand more weight. 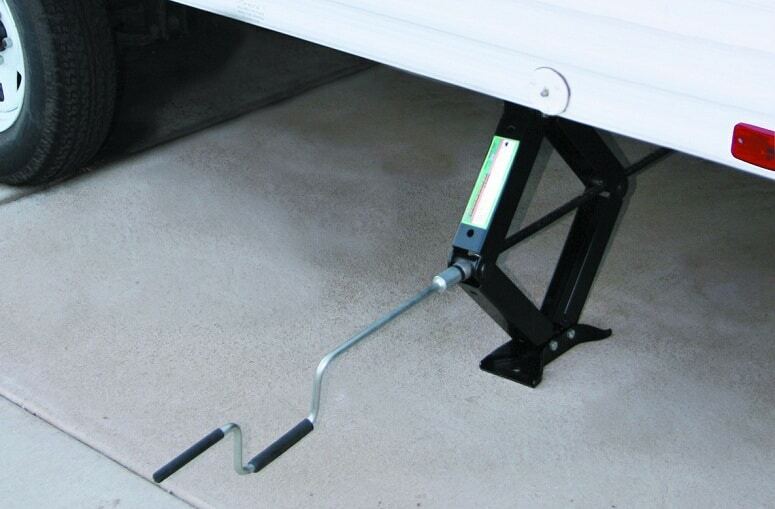 If you get an electric RV leveling jack, you’re going to save time setting up your campsite each time you drop anchor. However, if your electric component malfunctions, then it’s going to be very difficult to adjust. Most electric RV jacks don’t have a backup manual method, so you have to repair it, or buy a manual one from a local Walmart and install it to get yourself out of a rut. On the other hand, manual RV jacks put a bit more human error on the table. It’s fully up to you, without the help of a machine, to mount your RV properly and prop it up. If you side with an electric RV jack, it reduces your chance of mistakes and takes a lot of problems out of the equation. Last but not least, when it comes to installation, electric and manual are basically the same. It more depends on what type of jack you go with, as we’ve described above. Many of those varying types can be either manual or electric, and while a bit of wiring is included in mounting your electric RV jack, it doesn’t take much time once you know what you’re doing. You’ll notice we didn’t include scissor-knife jacks in our list above. That’s because they don’t work. They’re designed for compact cars and SUVs: vehicles with far less weight and dimensions than your fifth wheel RV. Standard car jacks aren’t meant to hold that kind of weight, especially the way it’s laid out. There’s nothing simple or linear about your RV; varying weight rests in different areas of your mobile home. Where a car is fairly evenly distributed (because there’s no fridge, no toilet, etc. ), standard jacks are designed to handle them. Their weight ranges are low, and they’re not intended for extended use. Since we’re looking at these jacks for your fifth wheel RV, we’re going to go off of the average: 12,000 lbs. That means that simply getting a tripod isn’t going to work. You’re going to have to get into your DIY mood and install a better system. These averages also run off the standard 40’ length of a fifth wheel. However, when you get into one or two-person fifth wheel RVs, somewhere around 21’ – 25’ in total length, you’re looking at about 4,000 – 6,000 lbs in total. Yes, they almost always operate off of 12V DC power. DC stands for direct current, which utilizes less energy than an AC system (on average). It’s wired directly into your RV’s electrical system, as if you were installing a tow package on a van to pull a storage trailer. Before committing to purchasing your preferred jack, take a walk outside and check out your current setup. Some newer models have short 12V wires, and may require you to either add an extension or replace them entirely. Be certain to inspect your manual and give a thorough check to your RV to ensure your jack will be compatible with it. If it doesn’t already include a jack pad, you’re going to need one. Jack pads help prevent damage to asphalt and concrete, but the real reason is to prevent structural damage to your RV. Jack pads work both ways, so you won’t have to pay for structural damages to your personal property, or private/public asphalt. Jack pads are inexpensive to grab (usually twenty dollars or less), and generally come with one to a package. Depending on what jack system you’re going with, you may need to purchase multiple units to fully protect your RV. When it comes to the bottom of the pad, reinforced rubber or high-grade TPE prevent scratches, damages and rust on your unit, while also providing lower pressure to the ground. Your RV is designed to be a travelling home away from home, and with that, there’s going to be plenty of structural hurdles to overcome along the way. One of which is ensuring that you use your jack properly to maintain a safe, level position. For starters, you’re going to want to find the most level ground possible to park on. If you’re going to an RV park, don’t be afraid to bring your own leveler and check out the spot before you pay and park it. If you’re using stabilizer jacks, you need to understand that they’re designed for their namesake: stabilizing, not leveling. You’ll have to use a bit of ingenuity to set everything right. Depending on how high you want your RV to be, you’ll also find yourself bringing leveling blocks along. These help when you find the right area that you want to settle down in, but it’s not particularly level. Bring multiple blocks of different heights. There are over a dozen different jack types, and you’ll need an individual tutorial for every one. We just want to get one point across: use extreme caution, even if it’s not your first rodeo. Judge the give and pull of your RV and the jack when you use it, and take it slow. The length, extended dimensions and overall weight all factor in. Many RV owners (first-timers) often make the mistake of just comparing the weight capacity of the jack to the overall weight of their RV, but it also comes down to pressure and how it’s distributed. If you have a party of six and together you add 700 – 900 lbs extra to the weight, plus all your belongings, you have to think about that. Systems with four stabilizers/levels often work extremely well when you have a long list of passengers. These little wonders help you out immensely if you’re leaving early in the morning, or getting to the campsite late. They typically shine bright enough to offer you assistance, without being too distracting or potentially bothersome to neighboring campers. How long do you spend out, and how often do you go? You can do a quick search, and find a hundred tailgating nightmare stories where trailers that are parked for three or four days put a dent in the ground, or depress the asphalt all the way back down to the dirt beneath. We want to avoid that. Your frequency of use determines how much stress you’re going to put on your RV, and how much power you need in your jack. The last thing you need is a product that’s going to make using your RV more difficult for you. 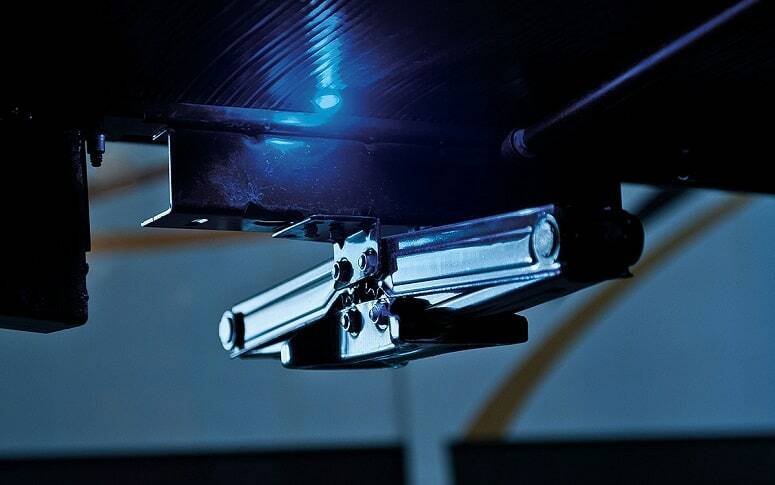 We’ve done our best to stray away from products that require immense pressure or require additional helping hands to operate, so you can operate them confidently and as easily as possible. Even if your trailer jack works wonders on supporting your RV, you don’t want to have an aggravating time getting everything started. We found some RV trailer jacks that were a chore-and-a-half to install, all because of the electrical system. The ease of installation (and for that matter, future repairs) is a major factor in your final decision. The very best electrical systems for RV jacks are 12V DC. Since there’s nothing in your way when you have the perfect jack, every road in America is just waiting for you to conquer it. Every campsite becomes a viable option. You have the know-how, the best products to choose from, but now there’s just one question remaining; how soon can you get back on the road?